Owen and Chrissie return from their honeymoon, but their happiness is short-lived when Chrissie’s scan reveals that the baby may have Down’s Syndrome. Owen says that she should not worry and wait til Hagi can do another scan and confirm it and he warns her that having tests taken might be risky. Chrissie is not sure what to do, but Owen says it’s all up to her to decide and eventually she says that she will keep the day; after all it is their baby. Ed tries to talk to Chrissie but she quickly informs him that what happened between them was a mistake. Her day doesn’t get any better when she notices Sandy is behaving oddly around a patient, Alice Harman. Alice is about to have heart surgery and when she leaves her purse to Sandy, Sandy steals some money from it. Later, after returning from theatre, Alice has a stroke and dies. Sandy rememebers how Alice said that she does not have any family, so Sandy sees her chance to steal the woman’s necklace. She is surprised when Alice’s sister suddenly appears and asks where the necklace is, since it is actually hers and Alice used to be borrowing it. Chrissie says that Sandy should look for it and she realises that she can’t steal it. Ed is still frustrated that recently returned surgeon Alex Adams has been given the locum position, especially when they mess up with two operations and both blame each other, and Jess is also finding him difficult to work with. She later confides in Mubbs that she has written a notice of resignation. His reaction surprises her; he pursuades her to retrieve the note and then, flirting, leads her to the staff room. But they are caught in a compromising position by the newly installed CCTV camera behind them. Ben is surprised when his ex, John, arrives at Holby. 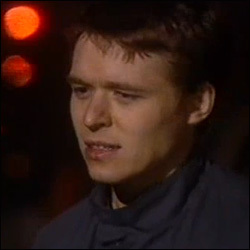 Although reluctant at first, Ben agreed to go for a drink with him and is stunned when John admits that he has left his wife and is still in love with him. Ben resisits his advances but, on leaving the bar, discovers that Tony has seen them together. Martin Waller is a patient that comes into hospital after collapsing, three weeks after having heart surgery. He has been working even though he was not supposed to and now he has got blood around his heart. When Alex tries to remove it, Martin suddenly arrests and they have to take him into theatre, at the same time as Ed has put Alice Harman on by pass, assuming that Alex soon will be there to complete the operation. Luckily Mr Loftwood appears and can do one of the operations, while Alex saves Martin. Beth, Martin’s pregnant wife, comes to the hospital to visit her husband, but soon she starts giving birth and when Martin wakes up from the operation he has got a new born child. Another woman giving birth is Natalie Wade. She is trying to give birth completely naturally, but it just takes longer and longer and she is in lots of pain, so she agrees to take an epidural and some medication to speed up the process. When she has given birth Lisa tries to get her to contact the father and after a while she agrees. When he comes to visit her, he says that he thought she said that he should not be part of tha baby’s life. She says that the child need a father and asks if he is willing to be that. Steve: What? Right now? Cheers, thanks a lot. Jess: Steve, can I have a quick word? Steve: Not now, now is not a good time, we’ve got a cardiac case coming. Natalie Wade is played by Kim Vithana, who later joins Holby City as Rosie.